News of Sinn Féin‘s big gains in the Northern Ireland Assembly elections is reaching American media outlets, and with it the usual sectarian shorthand that has virtually disappeared from Irish and British coverage. While Jewish-Muslim tension remains fundamental to the Israeli-Palestinian conflict, Catholic-Protestant animosity has a shrinking role in today’s Northern Ireland political narrative. But the storyline remains catnip to many U.S. news outlets. Sinn Féin, the main Catholic nationalist party in Northern Ireland, won its greatest number of legislative seats ever after a snap election this weekend, creating a virtual tie with its Protestant rivals and throwing nearly two decades of peaceful power sharing into turmoil. Voters in Northern Ireland will go to the polls on March 2 in a snap election that was forced by the main Catholic party, Sinn Féin, after the collapse of a regional government in which Catholics and Protestants shared power. The newer story introduces the concept of a nationalist party — instead of simply Catholic –in the first sentence. In the January story, the word nationalist isn’t used at all. The fourth paragraph does explain: “Sinn Féin wants Northern Ireland to stay in the European Union and eventually reunite with Ireland.” The word unionism is introduced in the same graph. Both stories were written by Sinead O’Shea. Northern Ireland’s snap election has left the rival extremes of politics virtually neck and neck for the first time — and facing a bruising battle to put their Catholic-Protestant government back together again in an increasingly polarized landscape. The big winner from Saturday’s final results to fill the Northern Ireland Assembly is the Irish nationalist party that triggered the vote, Sinn Féin. The descriptions could benefit from modifiers such as “predominantly Catholic nationalists” or “historically Protestant unionists,” leaving room for those who do not fit the easy stereotype. We are a long way from the days of “Home Rule is Rome Rule.” Northern Ireland is increasingly diverse in its religious (or non-religious), racial and political make up. Winners of 13 of 90 seats in this election are from parties or independents that eschew traditional Catholic or Protestant affiliation. Their 14.4 percent share is up from 12.9 percent in the May 2016 election. Think it’s impossible for U.S. media to avoid this sectarian shorthand? NPR’s coverage, by Colin Dwyer, shows how the basic political divide can be explained without using religious identifiers. When the dust finally settled Saturday on Northern Ireland’s snap assembly election, it became clear a new political reality now awaits voters there. After an exceedingly strong showing by Sinn Féin, Northern Ireland’s government is split all but down the middle between Irish nationalists and their pro-British counterparts. The story does not use the words Catholic or Protestant. Only an online photo caption describes “the Catholic Falls Road” in Belfast. The word nationalist appears three times in this story, lowercase unionist four times, plus an additional reference to the Democratic Unionists. Sinn Féin has emerged as the biggest winner in the North’s Assembly election after the party came to within one seat of matching the Democratic Unionist return of 28 seats. In a dramatic shake-up, unionists lost their long-enduring and highly symbolic overall majority in Stormont as the republican party came very close to securing more first preference votes than the DUP. 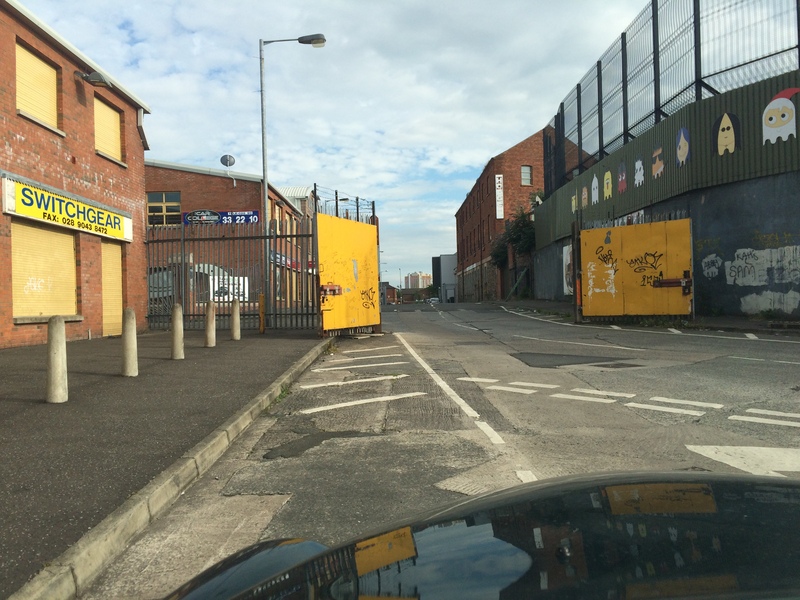 Peace walls, right, gated roads , center, and boarded windows are reminders of the lingering Catholic-Protestant divide in Belfast. Mark Holan photo, July 2016. I’m not saying sectarian labels are never used in Irish and British media coverage, but they are becoming as sparse as people in Northern Ireland church pews. I wonder if these newsrooms have made conscious decisions to keep religious affiliation out of their political coverage. To be sure, the “peace walls” separating Catholic and Protestant neighborhoods in Belfast are a stark reminder that sectarianism still exists in Northern Ireland. And the U.S. media coverage does include the important contemporary context of Brexit and the Northern Ireland renewable energy scandal. Alan Bairner wrote a chapter about international and local media coverage of the Troubles in the 1996 book, Northern Ireland Politics, edited by Arthur Aughey and Duncan Morrow. Remember, this was more than 20 years ago, and two years before the Good Friday Agreement. Certainly the people of Northern Ireland could have no grounds for complaint about the levels of interest shown by the international media, although they were frequently uneasy about the quality of the analysis which resulted from that media interest. … There is little evidence, for example, that British or, indeed, international coverage of the Troubles had a significant impact on the views of people in Northern Ireland itself. Most Northern Irish people formulate political views on the basis of numerous factors and their reaction to media output, regardless of its aim, is more or less predetermined. And the local press coverage? It would be preposterous to suggest that the owners and editors of Northern Ireland’s local newspapers are responsible for the divisions in their society. It is undeniable, however, that their papers, through the choice of stories which are published and even the use of language to tell these stories, give voice to the rival perspectives of the two communities and, as a consequence, give added strength to these perspectives in the eyes of those who hold them. Therefore, local papers as well as the [Protestant] News Letter and the [Catholic] Irish News have helped to reproduce sectarian attitudes and in so doing they have become complicit in the maintenance of the politics of division. This entry was posted in Northern Ireland, Politics, Religion and tagged Brexit, Catholic, Democratic Unionist Party, New York Times, Protestant, Sinn Féin on March 5, 2017 by admin.